In this article, we will look at how to choose the right match to bet on a draw by using statistics, and how to spot a fixed draw based on publicly available data. A football match can have three outcomes (with respect to one team): a win, a draw, and a loss. There is a category of punters who place a high priority on betting on a draw. Bookmakers offer rather high odds for draws. You will often read on the web that, since the probability of a draw in football is 33.3%, odds higher than 3 are beneficial for punters. But, in my opinion, the expected probability of an event is one thing and statistics is another. Let us turn to statistics first and see how often football clubs play with a draw. Just remember that the situation changes from year to year, so there is no point in looking back too far. Three last seasons should be enough, I think. The source of the data below is the website sport12x.com. Judging by the figures in the table, there is no obvious tendency in the outcomes. For most of the countries, the percentage of draws in championships has gone up and down. 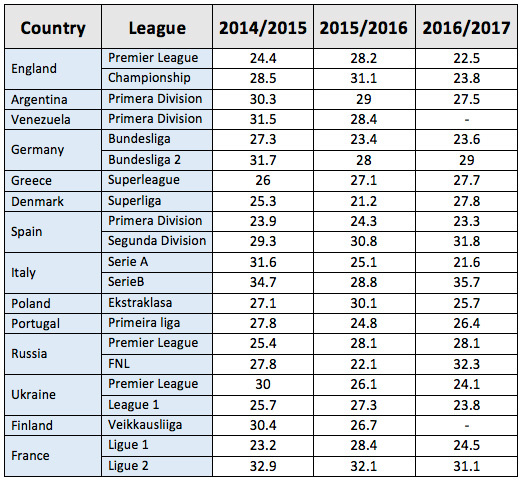 Only in some of the countries, such as Italy (Serie A), the percentage of draws has dropped, while in the Spanish second most important football league, it has, on the contrary, increased. The most striking gap here is between the results for Russia (FNL) — 22.1% and 32.3%. If you want to single out championships that are most ‘prone’ to draw results, these would be the second divisions of the leading European football nations — such as Spain, Italy, Germany, and France. To these should be added Argentina and Venezuela. As for the perceived probability of a draw, this depends on a number of factors that will be covered below. You cannot talk about 33.3% as if all outcomes are equally probable and ignore such factors as how strong the teams are, etc. It is absolutely clear that if a favorite plays with an outsider, the odds for a draw may go above 10, while for equally strong teams they typically vary between 3 and 3.4. Choose a championship based on the statistics of draw results. The second rule is derived from the first one. Pay attention to low-scoring championships. Obviously, the less goals are scored in a tournament, the higher is the probability of a draw. The teams should be approximately equal in strength. That said, it is advisable that the weaker team has a home field advantage. When choosing a match, take into consideration the style of play, such as the draw strategy or the away game mode. Consider also the attack/defense ratio. Also important is the motivation factor. This is where the stage of the tournament matters. You may hear that football clubs tend to be motivated. But I think that every situation is different and should be regarded individually. Oftentimes, by the end of the season, the two teams left do not have any more tasks to fulfil in the tournament and consequently, are not motivated to win. Do not ignore the opinion of bookmakers. 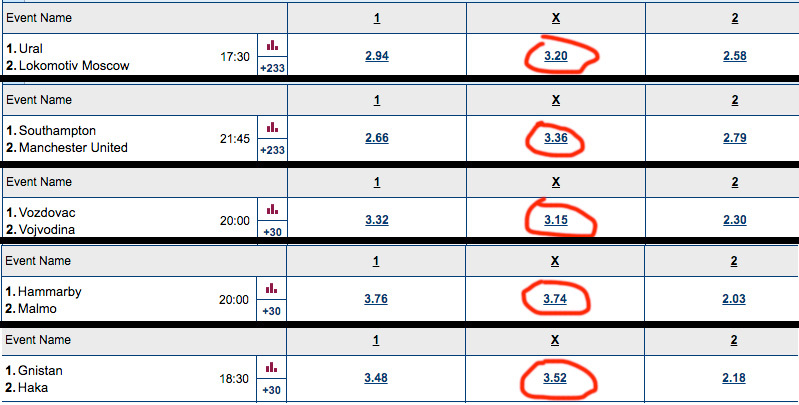 As a rule, their analyst teams suggest odds of around 3.00-3.20 for draws (provided the probability of a draw is high). As for betting on a draw with high odds (from 3.40), punters make the decision based on their own analysis and intuition. Fixed matches are one of the weaknesses of betting on a draw. One popular scenario is exchanging 3 points so that the teams could hold their current position. Most often this applies to the lowest leagues and clubs from the middle of the tournament table. The tactic has developed after they introduced the practice of scoring 3 points for a win. One of the signs of ‘dirty play’ is low odds for the draw. It is believed that if the odds for a draw are lower than 2.3, the match is fixed. To bet on a draw in football, you can use standard types of betting — single bets, accumulator bets, and system bets combined with a certain financial strategy. Let us have a closer look at this. The strategy is also known as “odd spread” or “odd difference”. The idea is to make 2 bets at the same time: one on odd total goals and the other — on a draw, thus forming an incomplete (partial) arbitrage (someone calls it dutching). I cover more of this here: Dutching Strategy. Odd difference. Chasing a draw for a chosen team. The key here is to pick a team meeting the criteria listed above. After every loss, the bet amount is multiplied by 1.5 (with the average odds being 3.0) to make up for the loss and receive profit. Clearly, the major pitfall of this scheme is a long no-draw streak. To evaluate the probability of this scenario, let us turn to the following service: https://en.24score.com/football/top_streaks/no_draw/. For the date indicated, the situation is the following. There are 79 teams in the range between 9 and 27 matches. Among them, we find ones that are usually recommended for betting on a draw. The series continues (see the nearest date in the table). The data above points to a high risk of a draw for one of the teams. In the second variation, we still chase a draw, only this time we choose independent, not connected events —according to the method described above. This variation makes more sense to me. One of the more popular variations of betting on a draw in football is the ‘2 out of 5’ system. Since we have already talked about accumulator betting before, let us move straight to the point (those who are new to the subject should study the information at the link first). We need to pick 5 matches that, according to our estimations, may result in a draw. Now, in the middle of May, most European championships are either over or there are only 1 or 2 days left, which makes our task more difficult. Still, we can conduct a small analysis and make our choice. Strictly speaking, the teams we chose hardly meet the requirements listed above. However, the opponents are about equally strong and almost in all the matches the favorites played as a visiting team. Suppose our bankroll is 200 dollars — 20 dollars for each selection. At the end of the day, it turns out that we were right in predicting 2 draws (the second and fourth matches). 20 * 12.56 – 200 = 251.2 – 200 = $51.2 — our profit. Betting on goals scored in the first half. Listed below are the criteria for choosing a match to bet according to the first strategy variation (on the 0-0 score in the first time). Obviously, the criteria for betting according to the second variation are completely the opposite. The odds for total over (2.5) should be less than 1.7. This means that the bookmaker estimates the probability of a large number of scored goals as lower than average. The teams should be approximately equal in strength. In this case, it is likely that the opponents will try to avoid making costly mistakes in the beginning of the match and take some time to study each other’s play first. Look at the statistics of the teams’ previous games with opponents similar in strength and style, excluding matches with high goal scores. In my opinion, even if you consider all the above circumstances, you still cannot make a 100% accurate prediction, as each of the 22 players can make a mistake leading to a goal at any moment (not to mention the possibility of an own goal).